Dress up your cookies with the crunch of candy! 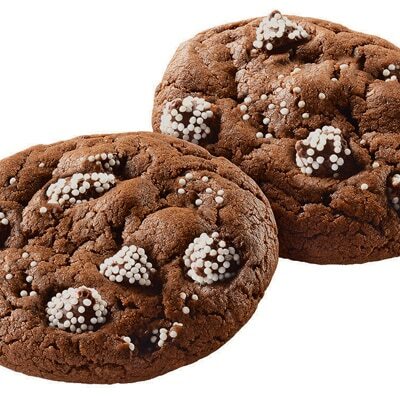 SNO-CAPS are added to these rich and fudgy cocoa cookies for some added flair to your cookie platter! COMBINE flour, cocoa, baking soda and salt in small bowl. Beat butter, granulated sugar, brown sugar and vanilla extract in large mixer bowl until creamy. Add eggs, one at a time, beating well after each addition. Gradually beat in flour mixture. Stir in 1 cup SNO-CAPS®. Drop by rounded tablespoon onto ungreased baking sheets. Top dollops with remaining SNO-CAPS®. BAKE for 9 to 11 minutes or until centers are set. Cool on baking sheets for 2 minutes; remove to wire racks to cool completely. FOR HIGH ALTITUDE BAKING (3,500 to 6,000 feet): Increase flour to 2 cups plus 2 tablespoons. Reduce butter to 14 tablespoons; both granulated and brown sugars to 1/2 cup each. No changes in bake time.